As middle America worries about health insurance or 401ks, the executives of the many S&P 500 corporations earn considerable compensation packages with all sorts of perks: bonuses, stock options and – sometimes – complimentary use of the corporate jet for personal travel. 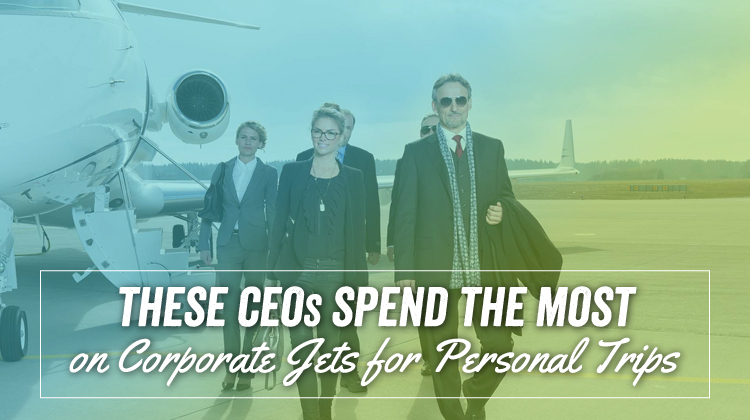 An investigation by the Financial Times shows that dozens of companies are still offering personal usage of the company jet for executives – and, in some cases, even family members and friends. These non-business-related flights are utilised mainly by just a handful of companies on the S&P 500: two-thirds of the total money spent on private flights comes from just 10 percent of the S&P 500. The report looks at the latest data available – 2014. In that year, more than $1.6 million was spent for Barry Diller to take personal trips in the corporate yet. Diller serves as the chairman of Expedia, the price-comparison travel website, and InterActiveCorp, the conglomerate that owns, among other properties, dating app Tinder. That $1.6 million amounts to almost $4,500 a day on personal flights on the jet co-owned by Expedia and InterActiveCorp. Coming in at a distant second to Diller is Steve Wynn, CEO and chairman of Wynn Resorts. In 2014, his company spent a little more than $1 million for his private jet-setting. Third place is owned by John Tyson of Tyson Foods. His personal usage of the Tyson Food jet amounted to more than $850,000 in 2014 – around $2300 a day. For those looking for a trend to this type of unusual spending, companies that are controlled by a powerful family or a single founder are over-represented on the list. For example, Rupert Murdoch and one of his sons racked up almost $1 million between them using the Twenty-First Century Fox corporate jet for personal use. In another example, Facebook founder and CEO Mark Zuckerberg spent $1.2 million over 2013 and 2014 for his personal travel on the Facebook jet. That travel puts Zuckerberg as one of the top 10 spenders on private travel on corporate aircraft for both years. Many companies said the use of private usage on the corporate jet was expected. This is supported by InterActiveCorp’s securities filing which indicates that Diller, who sits at the top of the 2014 spending list, is required to use the co-owned aircraft for both private and business travel. Despite the explanation, spending millions of dollars on what amounts to personal travel for corporate executives who are already well compensated, can rub the average employee the wrong way. Taxpayers bristled over the excessive use of private jets was when auto executives travelled back and forth from Detroit to Washington, D.C. while advocating for a multibillion-dollar bailout.